Seb Reynolds’ side suffered their first defeat since the opening month of the season and they are now 12 points clear at the summit with eight games left to play. 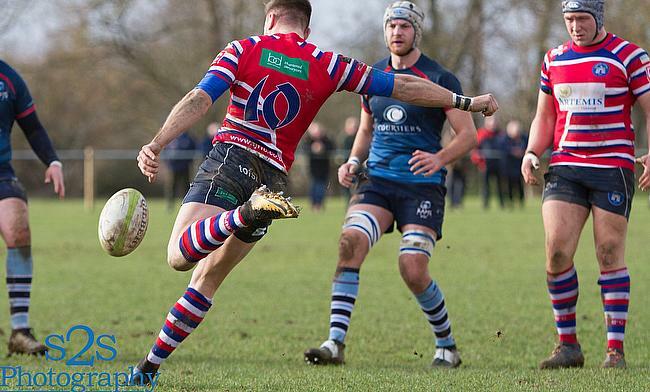 The men from Old Bath Road are still in the driving seat for promotion and Canterbury will be hoping to finish in the top two alongside the Rams. The City Men stayed in control of second place after their win over Clifton and they are now seven points clear of Tonbridge Juddians (3rd). Their fellow play-off contenders also picked up wins as Taunton Titans edged past Old Albanian and Henley Hawks comfortably beat Worthing Raiders. Down at the bottom, Birmingham and Solihull have enhanced their survival chances following a vital win against Guernsey. The Bees are now 11 points from safety, as are rivals London Irish Wild Geese, who fell to a defeat away at Redruth. Elsewhere, there were wins for Dings Crusaders and Old Redcliffians against Bury St Edmunds and Barnes, respectively. Rams RFC lost their first game since September as Tonbridge Juddians toppled the National Two South league leaders at the Slade. Seb Reynolds’ side had won 17 straight matches, but an in-form TJs produced a strong performance to inflict only the second defeat on the Rams all season. The visitors led 12-11 at half-time thanks to tries from Tom Vooght and Ben Henderson, while a Murray Galbraith-Lowe score and two penalties from Will Robinson kept the home side in touch. But Toby May and Duncan Tout both crossed for TJs to ultimately seal the victory in the second period, while Tom Humberstone scored late on to secure a losing bonus-point for the Rams. The result leaves Rams RFC 12 points clear at the summit, while TJs are still seven points behind the play-off place. Canterbury beat Clifton to tighten their grip on second spot in National Two South. Tries from Dan Smart and Harvey Young, alongside a finish from Charlie Grimes, gave Canterbury a commanding lead on 43 minutes, with Thomas Francis going over for Clifton. Mark Roberts pulled one back for the hosts in the opening stages of the second-half, but further tries from Tristan King and Ricky Mackintosh gave the City Men the bonus-point win. Oli Best also kicked 14 points for the away side, while Mitchell Spencer’s late try for Clifton was merely a consolation. Taunton Titans kept pace with their rivals for the play-off position as they battled to a victory over Old Albanian in Somerset. A Chris Francis try gave Taunton the lead, but Old Albanian hit back as Dan Watt landed a penalty on his 50th appearance for the club. Watt also was on hand to land a conversion following Matt Deane’s try as OAs entered half-time 8-7 up. A disjointed second period ensued, but the decisive moment came from the boot of Gary Kingdom who slotted a penalty to clinch the win for Tony Yapp’s side, who are now seven points behind Canterbury with a game in hand. Henley Hawks secured their third win on the bounce as they proved too strong for Worthing Raiders at Roundstone Lane. The visitors scored three tries in the first half through Tom Hall, George Griffiths and Tom Emery to lead 21-7, with Matt McLean going over for the Raiders. Henley continued to dominate after the break as Griffiths completed his hat-trick, either side of Dave Manning’s effort, to put the Hawks out of sight. Worthing then played their best period of rugby in the final quarter and they were rewarded when Harry Forrest and George Hammond both dotted down, but it is now five defeats in a row for the Raiders. Dings Crusaders secured a much-needed win as they got the better of Bury St Edmunds at Shaftesbury Park. Matt Smith’s first-half try and a penalty from scrum-half Steven Plummer gave Dings an 8-7 lead at the interval, with Jack Harvey crossing for Bury. The Crusaders followed the same pattern in the second period as Plummer added another penalty before Smith went over for his second score to make it 21-7. Oliver Walker dotted down on 71 minutes to set-up a tense finish in Bristol, but Luke Arscott’s side held on for a welcome victory. London Irish Wild Geese’s survival aspirations suffered a knock back as they were thrashed by Redruth at the Recreation Ground. After Liam Prescott’s early penalty for Wild Geese, the home side put their foot down and never looked back once scrum-half Rob Coote had scored the opening try. Aaron Simmonds landed a penalty to make it 8-3 at the break and the Reds were rampant following the interval. Richard Kevern, Matt Bowden, Simmonds, Connor Gilbert and Matt Gidlow all crossed at Redruth secured their third home win on the bounce. As for the Wild Geese, they are 11 points from safety. Old Redcliffians scored 15 unanswered second-half points as they beat Barnes at Scotland Lane. Tom O’Toole’ and Ezra Caven exchanged early scores, but the hosts trailed 15-8 at half-time following a converted Josh Davies try and a penalty from Josh Coles. However, the home side replied in fine fashion after the break as Caven and Henry Bird both scored tries, following Kieran Hill’s penalty, to secure the win for Old Reds. Birmingham and Solihull boosted their survival chances with a bonus-point win over relegation rivals Guernsey. Two tries for Guernsey gave them the perfect start in the Midlands, but that was as good as it got for the Raiders as the home side sparked into life. Harry O’Brian, Matt Dight and Matt Spink all crossed before the break and the Bees surged clear in the second half. Dight completed his hat-trick before Zane Raimondi put the gloss on the win for Pete Glackin’s side, who are now 11 points from safety while with eight games to go in their season, Guernsey are bottom of the division and 16 points away from climbing out of the drop zone.